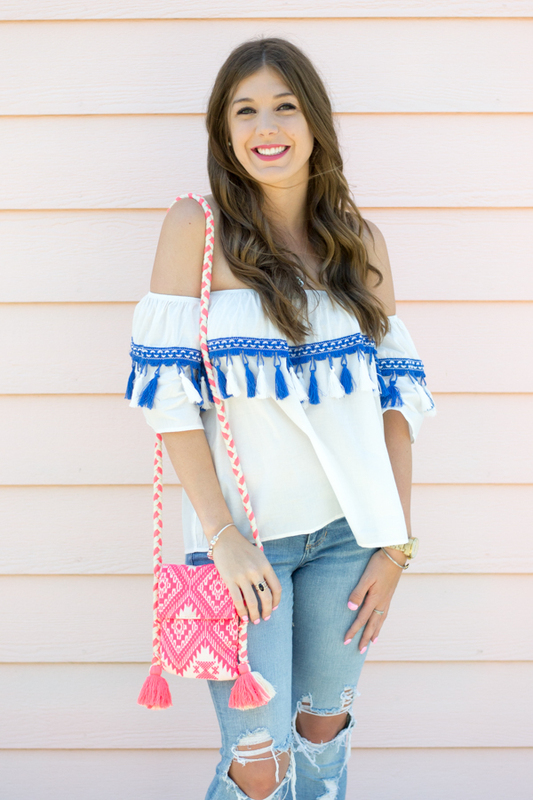 I hope y'all aren't sick of tops with tassels yet, because I don't see them going anywhere anytime soon! It's definitely a trend that I can get behind though because they are just so fun! There are so many ways to incorporate tassels into your outfit- clothing, accessories, jewelry.. There definitely is not shortage of tops with tassels right now! 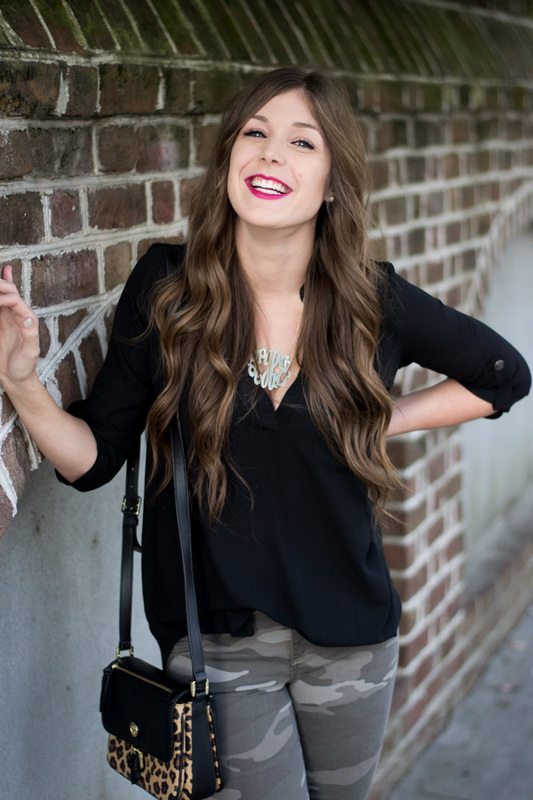 I also want to point out that this purse is currently on sale for under $14 and comes in black & white too! It is super cute and perfect for the days when you only need to carry the necessities (for me that's my phone, credit card, and lip stick)! That is such a cute top! And i just love that bag!! 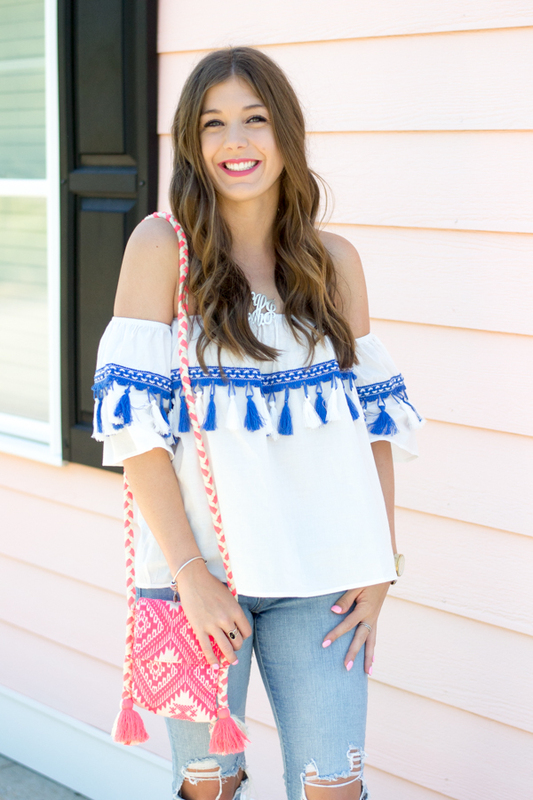 I looove tassels as much as I love the off-the-shoulder trend! You're killing it girl! Those tassels are EVERYTHING! So fun! I love this look so much! The tassels make this look so fun! A) I love your blog title! B) I absolutely love this outfit! That bag, that top, and those shoes? NEED them all to live. That purse is so cute!! Perfect for summer. Hahaha dying over your title! Love all the raffles! That bag is too cute! What a fun top! I like your shoes, too! 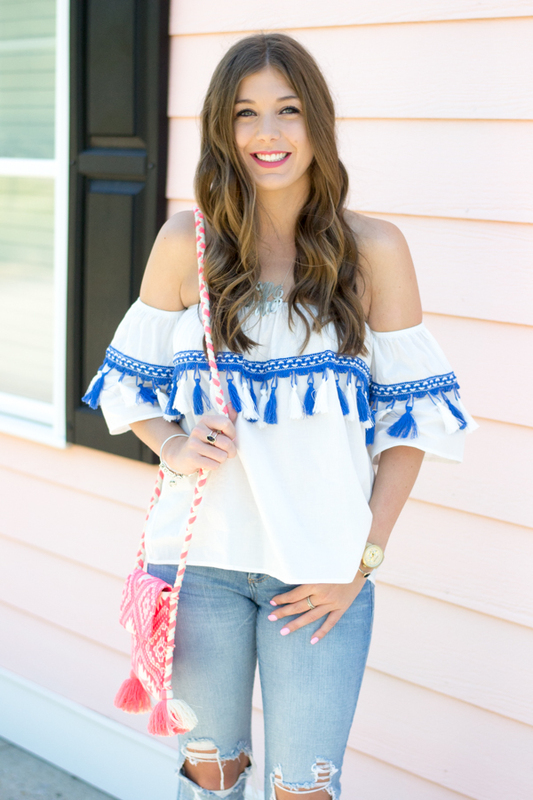 Ohh love this tassel top!! And can't believe those shoes are from Target!! This is such a gorgeous top! I LOVE the tassel details and your sandals! Love the studded embellishments! Now I definitely need to stop by Target's shoe section, lol! Love this top! So cute. 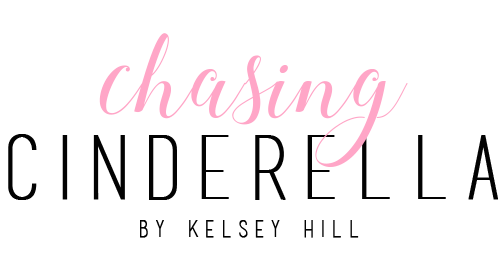 love the title of this post and your fun bright bag! I love everything about this outfit, Kelsey!! I especially love the pops of color! I love your entire outfit! Super cute! Such a cute top! That tassel detail is fab! 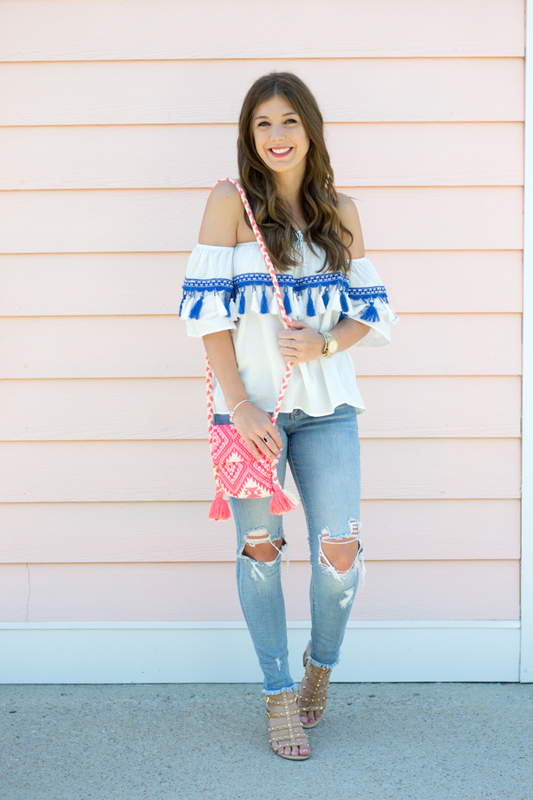 Such a cute look, I love tassels! And your hair looks gorgeous! 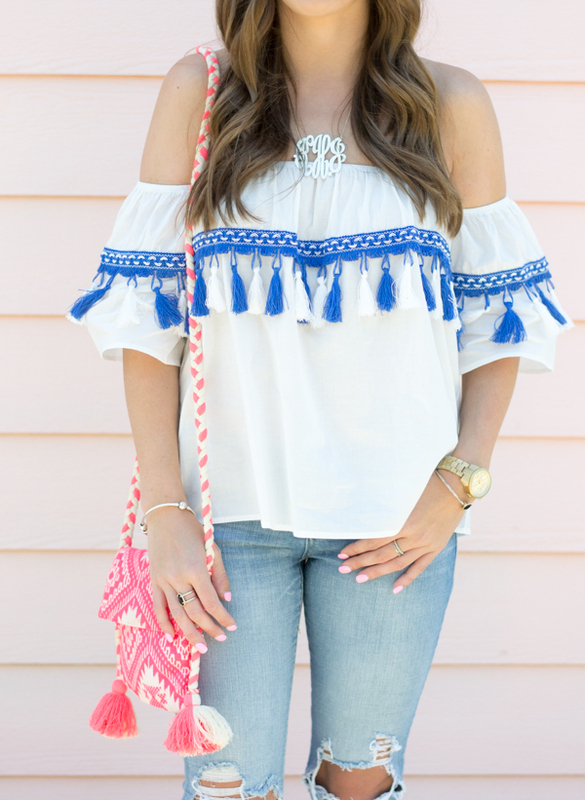 I lovelovelove the tassels on that top! So cute! I am definitely not sick of tassels! Love this darling top.